Druidic links to mistletoe (see recent posts) are often, these days, considered established as fact, despite very little evidence. The Druids left no written records – and the only accounts we have are written by Romans (Pliny and Caesar) who may not have had direct knowledge, and who may also have had an interest in sensationalist propaganda about the natives of their conquered territories. Or maybe they wrote with absolute accuracy. We just don't know. So we don't really know that the Druids of northern Europe (France and Britain) worshipped mistletoe. And if they did we don't really know why, or what form that worship took. But it's a good story, and it makes an interesting tradition for Druidry. So that's all right then. But should the druid 'myth' trip over into science? If you've ever read accounts of Lindow Man, a 2000 year-old preserved bog body found in a Cheshire peat bog in 1984 you may recall that these state that he had mistletoe in his gut, and that this may indicate a ritual sacrifice by druids. The newspapers loved this story – and it's even mentioned on his interpretation panel at the British Museum. This states that there is evidence for a ritual death (which there is) and that "it may be no coincidence that shortly before his death he had a drink including mistletoe" and "Mistletoe was sacred to the Druids, and it is recorded that Druids carried out human sacrifices". Some reports (not at the BM),even suggest the mistletoe was the poison that killed him. The story tends to resurface every time Lindow Man goes 'on tour' in regional museums too. AND (this is the best bit, which you'll only find if you read it up in detail) guess how much mistletoe was found? 4 pollen grains. FOUR POLLEN GRAINS! And the BM turn that into a 'drink including mistletoe'. All it really indicates is that he died in February/March when mistletoe is flowering, and that he was relatively near to some mistletoe when he ate his last meal. There's no evidence there for deliberate ingestion at all. It's all spin, and not very good spin either. So, I was most relieved to find, earlier this year that in the British Museum's new (2009) book on Lindow Man (written by Jody Joy – details below) they now admit that whilst 'much has been made' of the misletoe in his gut it is 'possible…that… it could have been ingested inadvertently'. More probable than possible I'd say. When I'm next at the BM I'll go and see whether they've changed the interpretation panel. Here's that recent book on Lindow Man – a short booklet really, very readable, and available from Amazon at just £5.00 incl UK delivery. Here’s the Mistletoe Queen, Holly King et all with Trevor Harrison (Eddie Grundy). Deputy Head Girl acting as her Attendant. In recent years the Head and Deputy Head Boy have also become involved, as the Holly King and his companion. Why Eddie Grundy? Well (I think I already covered this in a previous post) Eddie Grundy, a character in the long-running BBC Radio series The Archers, often sells Ambridge mistletoe in the run-up to Christmas, and even thwarted David Archer’s plans to take mistletoe to the Tenbury Auctions once, so he seems particularly appropriate. And of course it’s not really Eddie, it’s Trevor Harrison MBE who plays Eddie. Trevor is a Worcestershire lad – brough up in Stourbridge and now living in south Worcestershire, so he seems even more appropriate. This year’s Mistletoe Queen is Sophie Merrick, with her attendant Abi Smith. The 2009 Holly King is Luke Deakin with Graham Thomas as his companion. Here they all are eating pork rolls in a bus shelter. Starting with a gathering at the Rose and Crown at Burford (the Shropshire side of the river) where Suzanne Thomas set out the programme for the ceremony – with differing active and speaking roles for several people. A quick marshalling in the car park, with the new Mistletoe Foundation banner, and 2 community policemen to help us over the road. Down Teme Street and off into the Burgage, a small park area close to the town centre. Here’s Suzanne leading the procession. By the time we reached the Burgage the druid procession had been joined by a small crowd of onlookers, which was encouraging (the druid group didn’t attend events in town last year, 2008, because of the feeling that some townsfolk weren’t keen – so we were anxious to heal any rifts this year). The ceremony itself, honouring the mistletoe in a way that reflects ancient beliefs, was fairly complex relative to previous versions – but most of our onlookers stayed the course. Spirits of time and place, ancestors of land and traditions were asked for blessings. Peace was called in the Quarters (E. S, W and North), and fire and water were used to consecrate the circle. Local traditions of Caradoc and Arthur were described and then Teme valley local produce was given special mention – the local hop-growing represented by beer, the local apple growing represented by apple juice, all shared around the circle and over the central mistletoe. The central mistletoe was then divided up amongst druids and onlookers alike before the remainder was ceremonially flung into the River Teme. Where it sank very convincingly and instantly. 1. Is it a bumper year, or is there a shortage of mistletoe. 2. Are prices high or low. 1. This is a 'glut year – loads of decent mistletoe. To clarify – this doesn't mean there's more mistletoe than usual – it just means that the plants have large numbers of berries, and so are more saleable. There is no shortage – sorry to disappoint those journalists who always (why?) seem to want to report a shortage. 2. Because of the answer to 1, wholesale prices are relatively low. To clarify – this dosen't mean that prices in the shops will be low – only wholesale prices for raw freshly harvested are low. The profit margin on mistletoe is so low after transport and trimming and re-transport, that retail prices will probably be the same as usual. Happy National Mistletoe Day! Today, 1st December, is the date we set for Mistletoe Day when it was established by the Tenbury Wells Mistletoe Festival back in 2003 (or was it 2004?). Not that you'd know – as most of the folk who do celebrate it do so on the first Saturday in December – which will be the 5th this year. 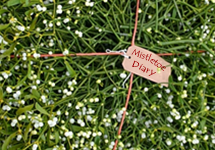 For mistletoe events on the 5th click here. But back to today – we have two msitletoe activities lined up in Tenbury – and yes I was up at the crack of dawn, again, to witness them. First up a small druid gathering (that's a gathering of a few druids, not a gathering of very little druids). This takes place at today's second mistletoe event – one of the Tenbury mistletoe auctions, though the druids are there well before the auctions begin, to help the auctions and mistletoe along witha druid blessing. This Mistletoe Foundation event is attended by a handful of local druids, led by Suzanne Thomas (who is also organising some of Saturday's events, including the evening do). A brief ceremony and then a scattering of wine onto the mistletoe, row by row. This is our first frosty morning of this winter – and the mistletoe is glistening with ice, and looking very 'Christmassy'. 'Christmas', is in this context, a newcomer of course – celebrating mistletoe in midwinter goes back well before Christianity – but saying that frosted mistletoe is looking 'winter solsticey' doesn't have quite the same ring to it. Didn't stay for the auctions proper – too much to do elsewhere but I hear that mistletoe prices were relatively low again – as expected because of the abundance of high quality (well-berried) mistletoe this year.